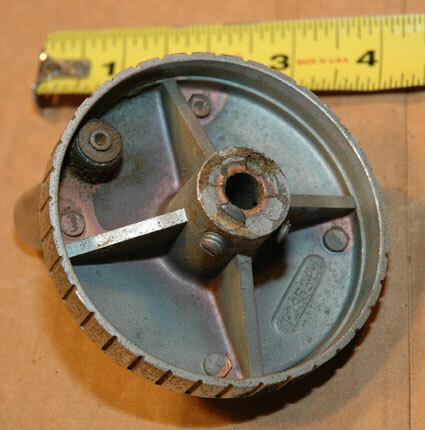 There were several types of Craftsman Table Saw hand wheels used on their saws. Some were plastic and some were cast metal. Table saw hand wheels were used to raise and lower the saw blade and to tilt the blade for angle cuts. 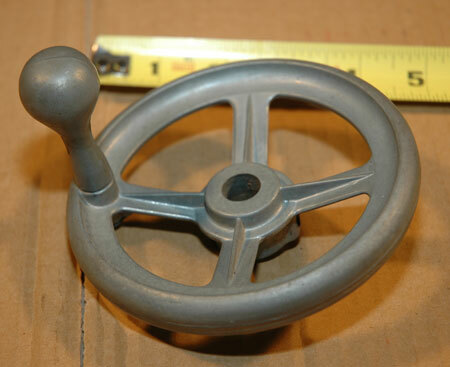 Craftsman table saws from the 1950's and 60's used a handwheel like the one pictured below. These were chromed pot metal and attached to the shaft with a set screw. Craftsman table saws since the 1970's used a plastic handle like the ones pictured below. Instead of a set screw these attached to the shafts of the elevation and tilt mechanisms with a machine screw into a tapped hole at the end of the shaft. 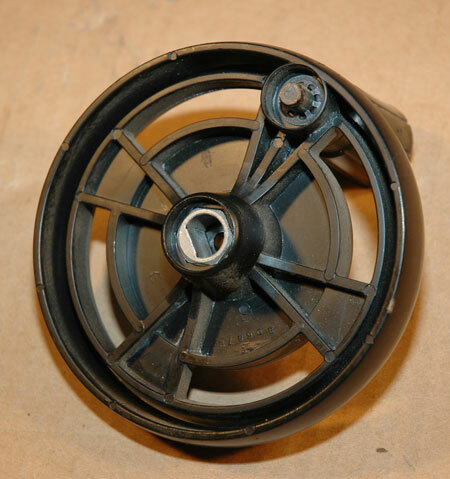 The better quality plastic hand wheel had a metal insert where the handwheel fit over the ned of the shaft. On less expensive Craftsman table saws, there was no metal insert. 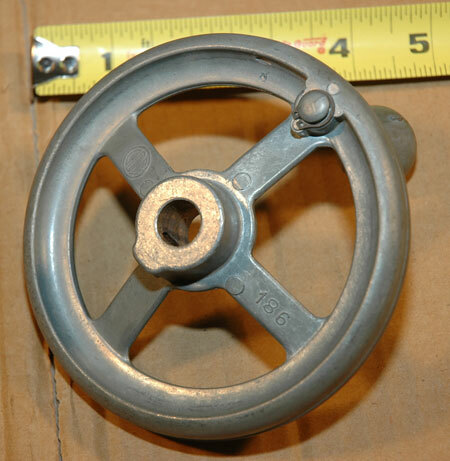 The handwheel simply fit over the end of the shaft and was attached with a machine screw. The Craftsman 10" Contractors Table Saw came with the metal hand wheels pictured below. 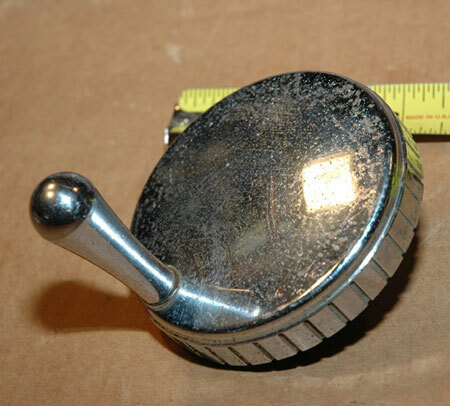 These were probably the best quality hand wheels that Craftsman made. They fit over the shaft and were secured with a set screw. 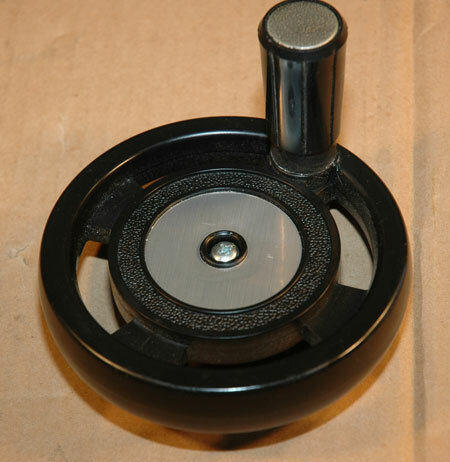 These hand wheels are 4 3/4" in diameter and fit on a 1/2" diameter shaft.